The Gareth Bale show continued as he scored in three consecutive Premier League games for the first time in his career. Bale now has ten goals in his last twelve Premier League starts. Imagine how dangerous Tottenham would be with an in-form striker as Clint Dempsey struggles whilst deputising that position. Tottenham started the brighter of the two sides and Coloccini’s foul on Dempsey allowed Bale to strike a fantastic free-kick over the wall into the bottom corner of Tim Krul’s net. Newcastle, to their credit, bounced back well with their French contingent impressing. Gouffran scored his first goal in the Premier League to level it up for Newcastle however it wasn’t all good news for him – he unfortunately had to be taken off for a serious looking injury. Looking at the stats Spurs seemed to create the more clear-cut chances and they managed to put one away which ended up as the winner. The major difference in the two sides was the in-form Gareth Bale. He seems to be taking Tottenham Hotspur to the Champions League all on his own at the moment! Thirteen goals (one every 149 minutes) in the Premier League and fifteen overall also makes him Spurs’ top scorer! 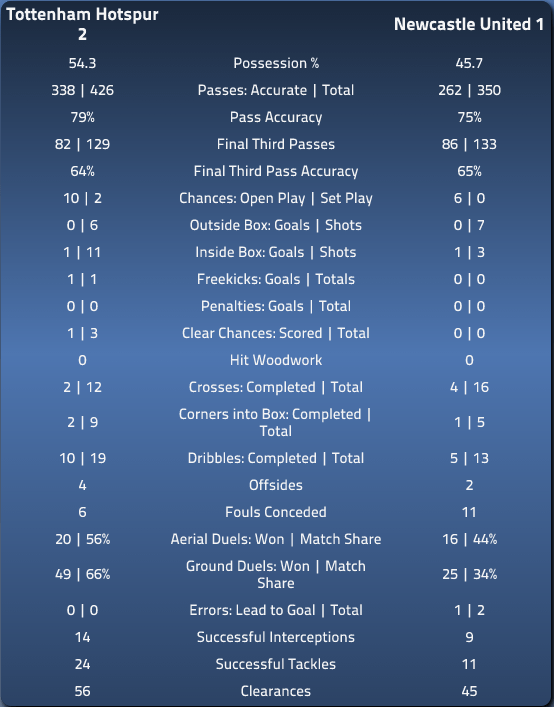 We’ll leave you with the Match Summary from our stats centre. Please subscribe for access to in-depth players stats! Categories: Newcastle Utd (NN), Premier League News, and Tottenham Hotspur (NN).' 'Tags: English Premier League Opta Stats, English Premier League Stats, EPL, epl opta stats, EPL Stats, Gareth Bale, Gareth Bale Stats, NUFC, NUFC Stats, opta, Opta Stats, premier league, premier league opta stats, Spurs Stats, THFC, Tottenham 2 Newcastle 1 Match Summary, and Tottenham 2 Newcastle 1 Stats. Life without Bale for Spurs. Is a Replacement waiting in the Wings?